Improved Tele-vision explores the history of a controversy. In 1899 the musician Arnold Schönberg composed Transfigured Night. In the 1940s, in Korea, the future pioneer of video art, Nam June Paik, studied composition and felt a deep admiration for Schönberg’s work without having even been able to listen to it, so much was occidental avant-garde music difficult to access in Seoul at this time. When he heard Transfigured Night, Opus 4 for the first time, his disappointment was so great that he decided, twenty years later, during a dance event organized by Merce Cunningham in New York, to play it at a speed four times slower than the norm (16 revolutions per minute instead of 78 revolutions per minute). He had this version edited onto vinyl and played it as his own composition in 1977. 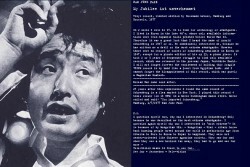 In 1979, the artist Dieter Roth, shocked by Paik’s actions, decided to play his recording four times faster, bringing the piece back to its original speed. He also edited a vinyl and presented it as a different work. In 2001, Cornelia Sollfrank found herself in this lineage of avant-garde artists by proposing her own version of the work, her own vision of the controversy. 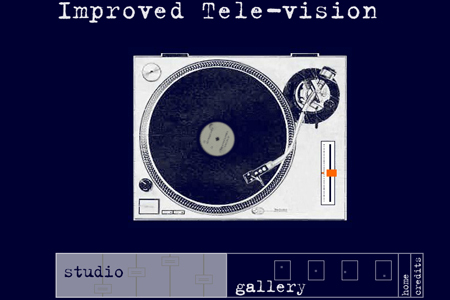 Improved Tele-vision is an online work of art in the form of a website. The first space, a “studio” whose interface represents a turntable, is interactive. The turntable plays Transfigured Night in its original version. The spectator is invited, using the control buttons, to modify the play speed while it plays. 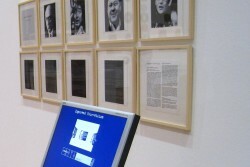 The second space, the “gallery,” contains portraits of different artists involved along with their claims about their personal motives. 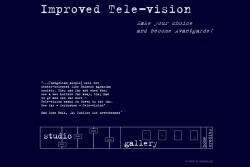 Improved Tele-vision offers a critical and ironic look at the world of art and artists. In a capitalist society where everything, even works of art, become merchandise, it raises questions about the artist’s creative practice by offering each visitor the chance to propose a personal version by modifying the speed of the piece and personally becoming a new author. It is an all the more relevant a reflection in the digital age when copies and downloading allow us to easily get ahold of works and trouble the standard notion of copyright. She thus promotes Paik and Roth as the precursors to a new practice of creation. 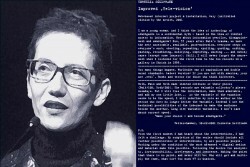 Cornelia Sollfrank (1960-) is a German conceptual artist, hacker and researcher known for her early engagement, starting in the middle of the 1990s, with online art and cyberfeminism. Her artistic and academic works often take on the question of copyright in the testing of new models of artistic provenance particular to the digital age, in the pursuit of all types of artistic appropriation, and in the deconstruction of myths about genius and originality.